Can heartbreak cause heart disease? UNB assistant professor Dr. Kelly Scott-Storey’s research is some of the first to examine the link between women who have experienced violence and their heart health. Dr. Scott-Storey was interested to see if women who have experienced violence, are at a higher risk for heart disease. It’s a topic that’s garnering a lot of interest these days. Violence is so widespread that it has become an area of research for Centers for Disease Control and Prevention (CDC) because of the negative effects it can have on a person’s health. Despite remarkable progress in diagnosing and treating heart disease, it still remains the leading cause of death and hospitalization in Canada. “With heart disease not all the factors that increase risk are known. We know for example, that high cholesterol and obesity can increase risk, but there is a growing interest in better understanding how social determinants, such as abuse/violence can affect heart disease. There is a big gap in our understanding of how to mitigate the effects that lifetime violence has on health,” Dr. Scott-Storey said. Dr. Scott-Storey’s work shows that women who experience violence/abuse are at higher risk of heart disease. She explains that the chronic stress from experiencing violence (either recent or past) negatively affects women’s mental health, increases health risk behaviours (e.g., smoking and overeating) and contributes to the overall risk for heart disease through an increase in blood pressure. More women die every year from heart disease than breast cancer. Symptoms of heart disease in women are often different from what we’re used to seeing in men. In men, early signs of heart disease can often feel like pressure or squeezing in the chest; this feeling may extend to the left arm. Women, on the other hand, may experience upper back pain, intensified heartburn or discomfort in the side of their jaw or left arm and not realize it could be a sign of heart disease. If women recognize these symptoms early and seek medical attention it can help lessen the damage and hopefully lower the mortality rates. 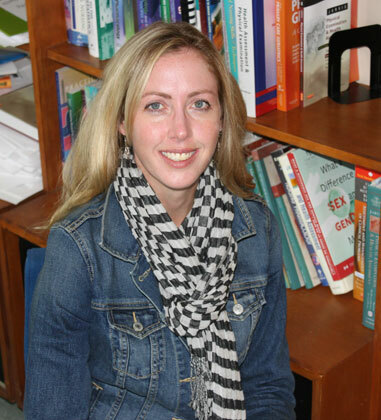 Dr. Scott-Storey was recently named health researcher of the month by the New Brunswick Health Research Foundation (NBHRF) for her work in the field of violence and health. . Continuing with the interest of lifetime violence and the impact it can have on health, her next study will see if the effects are similar among men. “Despite the prevalence of violence in men’s lives, there is little understanding of men’s experiences of violence and how it impacts their long-term health,” Dr. Scott-Storey said. The study will be an online survey and will have a health check component to measure the impact that chronic stress has on their long-term health. Six hundred New Brunswick men from varying experiences with violence including childhood, workplace and domestic will participate in the study. The findings of this study will be useful for programs and policies promoting and managing men’s health. For more information on the study contact 1–888–457–6600 or e-mail health@unb.ca.